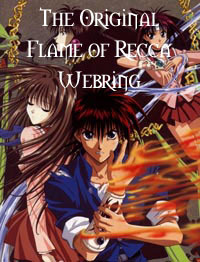 Welcome to the Original Flame of Recca Webring Homepage! Your page must be related to Flame of Recca in some manner or fashion. You need to fill out the form. You'll get a password which can be used to edit or add in the future. You need to add the HTML fragment to the URL you registered (the page you want the fragment on). Once that is done, and you have the info in the HTML code all filled out properly, E-mail the ringmaster to add you. The HTML fragment must be on the URL that you registered. If you have an opening page, you can choose to put it on your second page so as not to disturb your opening page. If you have both frames and no frames versions of your homepage, I recommend that the fragment be present on both versions so that it can be more easily found.. The homepage must not be a "Still Under Construction" page to a point where there is barely anything in the homepage. The HTML fragment MUST include YOUR ring ID in place of "your_id" and don't forget to fill in your membername and e-mail address. The ring logo MUST BE DOWNLOADED ONTO YOUR OWN SERVER. DO NOT LINK IT DIRECTLY HERE PLEASE!!! (To do so, right click with your mouse button and click "Save Image as". If you are a member of more than 4 rings, it would be great if you place ours at the top ^_~. The HTML fragment must not be modified in anyway except to add in the needed info. You can also change the font colors, etc if you want to, but the base HTML must stay the same (ie. you can't take the logo and stuff out of the table). Further changes may be allowed, but E-mail the ringmaster first. site is owned by mana-chan.